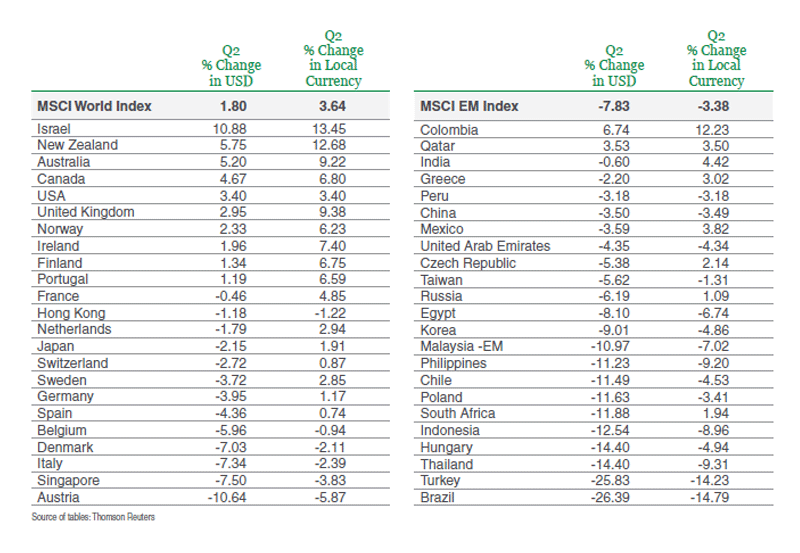 Global equities experienced mixed results for the second quarter as domestic equity markets generated strong returns and most international equity markets declined. Strong global corporate profits with solid regional and sectoral breadth aided performance. 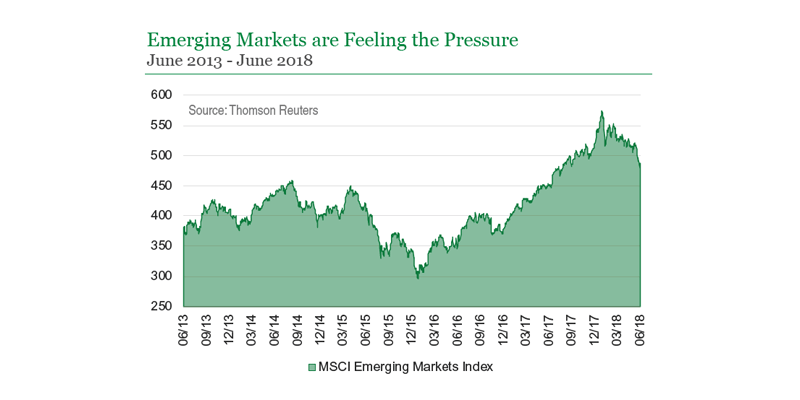 For foreign investors, emerging markets were the primary driver of equity losses abroad, as a strong U.S. dollar and rising trade tensions led to volatility in the space. From a style standpoint, global growth continued to outperform global value for the period. While the supportive backdrop from the beginning of the year remains in place today, several developments have increased the risk of market declines. Some of the largest risks include: the rise of protectionist policies that could stall business investment and disrupt global supply chains; the return of European political uncertainty and tension; China credit data that has shown a faster slowdown amid a deleveraging of the financial system; and the gradual tightening of global monetary policies that has led to reduced dollar liquidity and rising interest rates. The result is global growth that has become less synchronized. The US has once again jumped ahead and is the only major economy with improving leading indicators, aided by deregulation and fiscal stimulus. Escalating trade conflicts may further exacerbate growth differentials in favor of the US. We do, however, question how long the current cyclical strength can persist and expect the sustainability of US growth to become a greater focus. Nevertheless, the type of classic inflationary overheating is not yet apparent, credit markets remain well behaved, and financing is still cheap. Results were mixed in the fixed income markets as well. Aggregate global bond performance was slightly negative in local currency terms, due to rising interest rates, but significantly negative in USD terms due to the strengthening US Dollar. Over the short-term, we expect interest rates to consolidate. Over the intermediate to long-term, however, we expect there to be continued pressure for rates to gradually move higher. Although the global growth outlook has softened, labor and capacity constraints are still present and should turn disinflation to inflation. Going forward, markets may remain volatile amid continuing trade discussions, tightening global monetary policy, and rising interest rates. Considering the current backdrop, the economy is likely to continue outperforming financial markets, and lower future returns should be expected. In this type of environment, investors should recognize that a repeat of last year’s unceasingly positive market performance is unlikely, and that an actively managed investment approach will be critical in meeting financial objectives. Many of our key points remain the same since we updated our outlook in our First Quarter 2018 International Perspective. One thing that has changed, however, is that risks to the downside have become more worrisome. 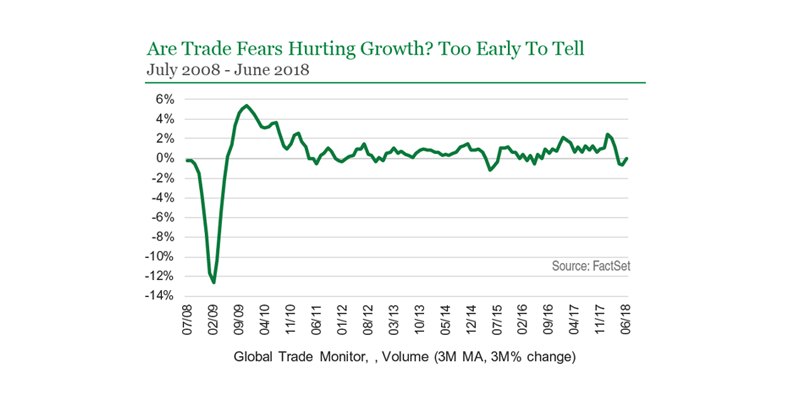 For investors, global trade war fears are particularly concerning, as trade tensions could lead to growth numbers that disappoint. We believe there are two angles through which escalating trade disputes can impact growth. First, there will be direct effects, which are a simple function of the size of the tariffs times the number of impacted goods. Second are indirect effects, which have the potential to be just as big of a concern, if not bigger, than the direct effects. These include headwinds that result from ripple effects through global supply chains, business and consumer confidence, and investment and capital expenditure spending that could be delayed or canceled due to the uncertainty of the environment. We also believe that the longer the ongoing escalating trade conflicts continue, the greater the likelihood that lost growth impacts international economies more than the US. While the direct and indirect impacts may hurt US growth eventually, the US already runs the largest trade deficit in the world, and international markets will suffer a greater deceleration should that deficit contract. Regarding the trade disputes between the US and China specifically, we see the conflict as going beyond trade and deficits, and is instead a rivalry between an established dominant power and a rising power. The US strategy is ultimately aimed against the state-sponsored industrial policy goals of China, specifically the “Made in China 2025” policy and intellectual property theft practices. For their part, China may find compromise a challenge as China’s industrial development goals and policies are inherent to China’s state structure and core economic understandings. While we are not calling for a trade war specifically, we do expect these tensions to simmer for a long time to come. Should tensions escalate and tariffs rise beyond China’s ability to directly match dollar-for-dollar, then we see China as potentially retaliating by a number of means including: taking action against services trade and investment flows; subjecting US firms to regulatory and anti-trust harassment; removing US companies’ favorable policy treatment in China; resisting US products entirely; selling US Treasury holdings; and/or devaluing the yuan. Investors have become more concerned about Chinese currency devaluation, but we do not see it as realistic for China to weaponize the yuan. Recent weakness in the yuan appears not to be an explicit effort by the Chinese government, but instead a lagged effect related to a combination of growth, monetary policy, and foreign exchange differentials between the US and China. Further, any move to manipulate the yuan would increase capital outflows, pressure the government to deploy foreign exchange reserves, and decrease stability right as China is attempting to prove itself as a reliable, stable global economic powerhouse. The question of whether investors should “buy the dips” and take advantage of additional trade tension volatility ultimately depends on the persistence of trade uncertainties, retaliatory actions, and corresponding impacts on business and consumer confidence, with significant implications for global governance structure and industry competitive dynamics long-term.